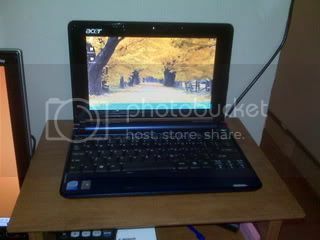 So I went out this weekend and purchased one of those cute little Acer Aspire netbooks for $300. While I admit that I was drawn to them based on sheer curiosity and wanting to touch the technology, I was ultimately interested in them for my oldest daughter to use for school work. I have seen a couple varieties of these - one that has a 120 to 160GB HDD and one that has an 8 to 16GB SSD. There is a big difference there in storage but not in price. I decided to go with the one that had an SSD. I spent a bit of time configuring this little fella. I started by deleting all the junk that comes pre-installed like the trial versions of antivirus software and MS Office. MS Works was also scrapped. I loaded up Firefox, Open Office 3.0, Skype, Audacity, AVG 8 free, and Thunderbird. After it was all said and done, I still had about 12 GB of disk space left. BTW, there is not an optical drive with this but I have all of my free installers on a flash drive at the ready so it was simple to install these things. I tested the start-up time and was about 1 min 30 from cold boot to off and running which I felt was pretty good. I tested the webcam with Skype and it worked very well. Overall, I am rather impressed with this one so far. I have used one of the Samsung Q1 UMPCs before and I think this is much better - especially with the full keyboard. It even came with a fully charged battery. I was expecting to have this plugged in for a while on the first night but it was good to go right out of the box (except for the windows set-up stuff). The battery got me a good 2.5 hours without hitting critical battery level. I found that it was also cheaper to purchase a portable DVD player case to use as the case for the Acer. The bags that they were selling for them were 10 to 15 dollars more. The DVD cases fit perfect so I went that route. I wouldn't mind seeing a fleet of these go out to a classroom as a mobile lab to see how well they work in that regard. These seem like they could be a nice 1:1 possibility. They are very light, compact, and perform the functions that a student would need to do. The SSD is a nice feature in that the netbook can be moved around without fear of damaging a HDD with spinning parts. Has anybody got a story to share about using these netbooks in the classroom? Perhaps a small review of one of the other kinds or one that has Linux on it? I look forward to hearing from you.